Jane Loevinger's innovative research methodology, psychometric rigor, and theoretical scope have attracted the attention of numerous scholars and researchers. Empirical investigations employing Loevinger's Washington University Sentence Completion Test of ego development (WUSCT) have appeared with increasing frequency and total more than 300 studies. Following the publication of the first comprehensive revision of the scoring manual for the WUSCT, this volume reflects on the strengths and limitations of Loevinger's developmental model. * What is its scope and intellectual tradition? * What evidence is there for construct validity? * What is its relationship to other social-developmental models? * What is its clinical relevance to Loevinger's model of ego development? This four-part grouping provides a framework for effectively organizing the present material, and frequently, the questions raised in one section are addressed in other sections as well. In the concluding chapter, Loevinger addresses some of the ideas that are proposed by the various authors. She also presents the origin of the ego development concept by recounting its history. "Jane Loevinger's gift to our field is a theory about personality growth and development and method and measure for studying it. The diverse company of scholars brought together in Personality Development add to her gift by providing thoughtful, provocative contexts for understanding ego development as a theory, a process, and a measure. Westenberg, Blasi, and Cohn have skillfully organized the book around large questions that matter--(What is ego development? Is the measure valid? How is it related to other developments? What are its clinical uses?) and have brought together an outstanding set of essays, addressing these questions. 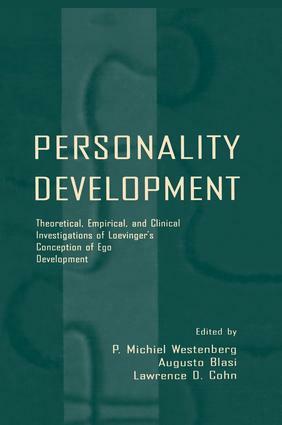 Broad in scope and coverage, rich in quantitative, qualitative, and clinical evidence, this collection will remind every serious student of personality development that Loevinger's gift is one to cherish." "This volume well demonstrates the generativity of Loevinger's conceptualization of ego development. Her modestly expressed but deep formulations, first offered three decades ago, have come to be recognized as having implication for many approaches to the study of persons: attachment theory, identity evolvement, psychoanalytic theory, pubertal development, ethical achievement, interpersonal styles, and psychotherapy, among others. Her central theme, variously expressed in these chapters, is that a fuller understanding of personality development requires going beyond sole concern with a superficial notion of 'adjustment' and requires instead focus on how individuals make meaning of their lives." "In the field of personality development, there has been a recent and welcome renewal of interest in theory-building, and this splendid book moves that effort forward by several steps. Starting from the foundation of Jane Loevinger's ego development model, the chapters explore essential and timely topics such as identity formation, subject-subject relations, and the definition of mental health. If anyone has doubts about the potential of Loevinger's model to speak to the core issues of personality growth throughout the lifespan, this definitive treatment will put them forever to rest. The book is an impressive scholarly achievement, valuable both for preserving the insights of a landmark developmental theory and for the original new contributions that it makes to the study of lives." Contents: P.M. Westenberg, A. Blasi, L.D. Cohn, Introduction: Contributions and Controversies. Part I:The Nature of Ego Development. A. Blasi, Loevinger's Theory of Ego Development and Its Relationship to the Cognitive-Developmental Approach. D.P. McAdams, Ego, Trait, Identity. R. Kegan, L. Lahey, E. Souvaine, From Taxonomy to Ontogeny: Thoughts on Loevinger's Theory in Relation to Subject-Object Psychology. D. Westen, Loevinger's Theory of Ego Development in the Context of Contemporary Psychoanalytic Theory. R.R. Holt, Loevinger's Conception of Ego Development and General Systems Theory. Part II:Construct Validity. P.M. Westenberg, J. Jonckheer, P.D.A. Treffers, M.J. Drewes, Ego Development in Children and Adolescents: Another Side of the Impulsive, Self-Protective, and Conformist Ego Levels. J.L. Pals, O.P. John, How Are Dimensions of Adult Personality Related to Ego Development? An Application of the Typological Approach. L.D. Cohn, Age Trends in Personality Development: A Quantitative Review. A.G. Rogers, Understanding Changes in Girls' Relationships and in Ego Development: Three Studies of Adolescent Girls. Part III:Related Developmental Models. J. Snarey, Ego Development and the Ethical Voices of Justice and Care: An Eriksonian Interpretation. L.H. Schultz, R.L. Selman, Ego Development and Interpersonal Development in Young Adulthood: A Between-Model Comparison. S.T. Hauser, E.B. Gerber, J.P. Allen, Ego Development and Attachment: Converging Platforms for Understanding Close Relationships. G. Labouvie-Vief, M. Diehl, The Role of Ego Development in the Adult Self. R. Josselson, On Becoming the Same Age as One's Mother: Ego Development and the Growth of Subject-Subject Relationship. Part IV:Clinical Implications. J. Rierdan, Ego Development, Pubertal Development, and Depressive Symptoms in Adolescent Girls. G. Noam, Solving the Ego Development--Mental Health Riddle. M. Horowitz, Organizational Levels of Self and Other Schematization. P. Young-Eisendrath, C. Foltz, Interpretive Communities of Self and Psychotherapy. L.D. Borders, Ego Development and Counselor Development. Postscript: J. Loevinger, Completing a Life Sentence.